If telling your recovery story touches just one person, you’re a success. He’ll see people with mental illness (maybe a loved one or himself or his clients) differently. He’ll have more hope because he met a real person overcoming great obstacles against great odds. People love to hear stories, and meet people, like that. To tell your story, just take a deep breath, look the people in the eye, and tell your own powerful truth from your heart, as you know it, as it happened to you, Make sure everyone can hear you. Use a microphone if you need to. Think only about what you are saying, to whom, and why. Forget about your hand gestures, posture, and tone of voice. If feedback from your first few talks shows you need to adjust anything like that, you will. Adjusting a golf swing is much harder. Speaking to a group is not easy for anyone, whether they have a mental illness or not. Practice shows you how powerful your message is, and that people like hearing it. But you will always get nervous and always have to prepare. Everybody has it, so don’t be nervous about being nervous. Speakers who look so relaxed and spontaneous in front of people got that way by practicing and learning to transform nervous fear into creative energy. If stage fright is stopping you, examine what it really is, and challenge those negative thoughts. Don’t be ashamed if you’re nervous. It’s even OK to tell people you’re nervous because you haven’t done this very often, or because these subjects are hard to talk about. That kind of honesty can get people on your side. BUT DON’T APOLOGIZE or dwell on it. People will accept your nervousness, but it’s not what they came to learn about. Part of your stage fright is probably fear that people will reject you or think you should make yourself well, lighten up, or try harder. People have probably told you that before. Tell the group how it feels to hear at times when you really can’t do things. Stigma, ignorance, rejection, blaming the victim — are part of the recovery story. But rejection like that almost never happens when you’re speaking. People admire a person struggling to overcome great obstacles against great odds. By talking openly and honestly, you become a fighter, not a victim, in their eyes. You’ll get the same positive reaction if you’re “just” working on your recovery and still have a long way to go or still experience difficulty or setbacks. People respect a brave struggle just as much as a victory, so be honest about it. Maybe you’re afraid that you don’t know enough, or don’t have professional expertise. No “expert” can argue with what really happened to you and how it made you feel. You’re the expert on your own experience and feelings. Are you worried that, if you tell your story, you’ll break down and embarrass yourself in front of people? Don’t talk about things that continue to cause you great pain. Talk about what you are able to talk about. It will be more than enough. Are you afraid that telling your story in public will embarrass your family, hurt you on your job, or in your personal relationships? You have to assume that everybody in your life will know everything you say in public to a group of people. When and what to disclose, to whom, and under what circumstances, is a major, extremely personal, decision. Nobody has a right to question your decision or push you one way or another. Don’t force yourself out of your comfort zone just because you think you should. Get plenty of rest the night before, but don’t drink or get high. Take a few deep breaths before you start. Don’t put yourself down, either seriously or in a joking way. Make eye contact with the friendly faces. In small groups, it’s OK to speak sitting down, at eye level with the group, if you’re more comfortable. It’s OK to make a mistake. Laugh it off with the audience. Don’t get flustered or put yourself down. Bring a friend for support, to sit in the back and signal if you can’t be heard, and when you’re near the time limit, to give you a friendly face to look at while you’re speaking and reliable feedback at the end. The first thing I do to prepare is adjust my expectations: I’m a success if I reach one person, make all my points before my time runs out, and avoid embarrassing myself. I don’t have to be perfect or reach everybody. I make sure my pants are zipped, my hair is combed, and my clothes are clean. Dressing right says I respect my message, my audience, and myself. I don’t put on a fashion show, but I wear a jacket and tie when I talk to professionals and church groups. At a school, I’ll dress casual, but like the teacher, not the students, because I’m not a kid and would look silly dressing like one. I dress casual for consumer groups, but not like someone who hangs around the mental health center all the time, even though I used to do that. If I wear a tee shirt, it will be a bright one with a nice design. I’m modeling recovery, not unhappiness. Nothing is more embarrassing to a speaker or an audience than a speaker who is unprepared. And don’t wait until the night before. Relax and think about something else the night before. Go over what you want to say for just a few minutes the night before. The second most embarrassing thing is running out of time before you finish. Have someone signal you when you’re two minutes from the end, and start wrapping up. I start preparing by thinking about how much time I have to fill, what kind of people I’ll be speaking to, and why they asked me to come. It saves time to start thinking this way, instead of about how much subject you have to cover, and then trying to make it all fit. I always ask why the group is inviting me, so I can accomplish their purpose, not just mine. Are they consumers, families, professionals, general public, a combination? While I’m doing that, I’m also thinking about how much time I want to spend on each topic. Once I have my topics in order, I might write out some more extensive notes to sharpen my thinking or estimate how much time I’ll need for a topic. Time is a natural organizing principle for a story. What came first, what happened next, and what happened after that? Another organizing principle I use a lot is “what helps and what hurts.” I’ll illustrate helpful and hurtful things with anecdotes from my life or someone I know. Often, professionals and family members like this kind of presentation because they want to know how to be better helpers. I almost always throw some topics out because they don’t fit the time. People won’t miss what you leave out. What matters is what you keep. When I have a pretty good idea what points I want to cover and how much time I want to spend on each one, I make up the note cards I’m going to use at my presentation. Don’t be self-conscious about using cards. They tell your audience that you care enough about them to prepare in advance. The cards remind you what order your topics are in, and prevent you from spending too much time on any one topic. They prevent you from wandering. They help you make eye contact, where reading a text creates a barrier between you and your listeners. But lots of speakers use cards the wrong way. If you have to stop speaking to read a card, or squint to make out what’s written down, you’ve defeated the whole purpose of using cards. Your story has to be in your heart, not on your cards. Four or five words on a card should trigger two or three minutes of talk from your heart. And write the words BIG, so you don’t have to look hard to read them, and not too many words on a card. Another good use of cards is for statistics, or direct quotations you want to express exactly. It’s OK to write those down exactly and read them. It tells the audience you care enough to be precise on this important point. Then if you want to, practice the whole presentation in front of a friend. But don’t let them confuse you with over-coaching. Helpful feedback starts with what you did well. Then, you want no more than two things to think about improving: one related to content and one to technique. Over-coaching is worse than no coaching because thinking too much about avoiding negatives can distract you from the truth in your heart. VISUAL AIDS help because using two senses helps most people remember things. But too often, speakers use visuals poorly. Then visuals hurt. NEVER TRUST A MACHINE. Always know what you’re going to do if your machine fails completely. If you use an overhead projector, bring a spare bulb and a long extension cord. If you use a VCR, show up early enough to make sure it’s working and cued to start where you want it. Don’t make your audience watch you fast forward and rewind, or help you find the PLAY button. If you use Power Point, make sure you know how to work the thing. Practice with your own hands before the day of the speech. Or else, bring someone with you who’s actually done it before, not someone who knows computers and thinks Power Point is easy. A common mistake is putting too much on a slide. The audience won’t know whether to listen to you or read the screen. Anything more complicated than a newspaper headline should not be on a screen. When using a graphic to illustrate a statistic, relationship or trend, explain every single element of it, and what the whole picture means. Most people, when they see a graph for the first time, need it explained. They also need time to absorb it. Power Point seduces speakers with too many visual devices. Drawing attention to how the slides are changing takes attention away from what the slides say. A picture competes with the message unless it clearly reinforces the message. A different color or typeface or way of changing slides is good when it emphasizes a change of subject. Variety without reason is confusion. When you use overheads or Power Point slides, make copies of them for everyone. Tell them you’re going to give them out at the end so they don’t try to copy them down while you’re speaking. But don’t give them out until the end, or they’ll read rather than listen to you. JARGON hurts because it makes people feel ignorant and excluded. Any expression only insiders understand is jargon. 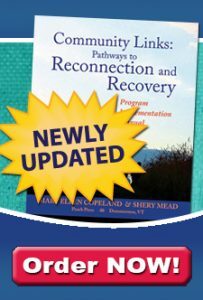 All initials and acronyms, including WRAP, all professional terminology, including “peer support,” and all words that mean many things to different people, including “recovery,” are jargon. When you use an expression that might be jargon, you must explain what you mean the first time you use it, just a few words that let people know what the expression means to you. EYE CONTACT helps break the barrier between you and the group. If it’s hard for you, look at people’s noses or mouths. Make eye contact with the obviously friendly faces, moving your eyes from one friendly face to another. Audience participation is good. When people ask questions and make comments, they’re involved, which means they’re hearing you. If they’re hearing you incorrectly, they’re allowing you to correct them. Sometimes, I invite people to raise their hands with questions or comments while I’m speaking. Other times, I give out note cards and suggest that they write things down as they think of them, so they don’t forget. I promise to deal with them at the end. Whether I do “during” or “after” depends on how worried I am about running overtime. If a question or comment is important to everyone, spend more time answering. If it’s something individual, give a quick answer and offer to talk one-on-one at the end. When people have to wait till the end to comment, there can be a very long silence. They’ve just been exposed to an uncomfortable subject, and they’re hesitant. Maybe they’re afraid to embarrass or offend you. Maybe they’re just moved by what you say and don’t know what to say. Wait them out. Once the first person talks, it will be easier for everyone else. One easy way to get people involved right away, and also kick off your topic, is to ask a question and have people call out one- or two-word answers. “What do you think of when I say recovery?” I repeat or reword each answer to make sure I understood it and that everybody heard it. Then I write it on a blackboard or flipchart. I don’t discuss or critique any answers, but I validate them by saying something like “good answer” or “very interesting.” When I have a good list, I can use it to start on my topic. But be sure to talk to that person one-on-one after the presentation. That person is in pain, often angry and bewildered. He can’t talk to just anyone about it, and senses that you will understand. Understanding is all he’s asking for, but suggesting a family support group can’t hurt and might help. Bring your NAMI chapter’s phone number . I tell people that I take medication, but never say what I’m taking. Someone might want what I’m taking because I’m doing well, and it just doesn’t work that way. Everybody reacts to every medicine differently, I say. If they don’t like what their doctor says, they should seek a second opinion from another doctor. I don’t want anyone to interpret what I’m saying to mean they should or should not take medicine. In my experience – that’s how I start everything I say about medicine — there are good and bad reasons to be reluctant to take something. Side effects are a good reason, but there is almost always something else to try if your side effects are uncomfortable. Coping skills have reduced the amount of medication I need to take, and that reduces side effects. I know a few people who have been able to use coping skills to substitute completely for medicine, but I also know people who got very sick trying to do that. Bad reasons are that the medicines are addictive (they’re not though you sometimes have to stop them gradually), and that AA says you shouldn’t take them. AA actually says you should take medicine if you need it. But some people in AA insist that taking psychiatric meds is being dependent on a mind-altering drug. It’s pure stigma, and against AA policy. They wouldn’t say that to someone who takes insulin for diabetes. Sometimes, I get a question from someone who thinks mental illness is all about brain chemicals and nothing else. Or a question from someone who thinks the whole brain chemical idea is wrong, and mental illness has nothing to do with chemistry. I say that IN MY EXPERIENCE both extremes are wrong. Medicine stopped me from being sick, but I had to make myself well (recovery and lifestyle issues). Some people I know simply find the right medicine and get well. Many trauma victims I know have symptoms and behaviors that look like severe mental illness, but have nothing to do with brain chemicals. I’m still only claiming to be an expert on me. Most mental health professionals will be as open or hostile to you as you are to them. Assume you were invited because someone wanted to hear your ideas. A few professionals are waiting for you to say that everything they do is wrong, and you know how to do it right. The minute they hear that, they stop listening. Talk about professionals who helped you, what made them good. Once you disarm that defensiveness, you can talk about the professionals who didn’t help, didn’t care, or set you back – and how they can avoid doing those things to their clients. One trap to avoid, especially with professionals, is slipping out of your experience into general statements you can’t defend with “evidence.” “Evidence” is a study of 20 people published in a journal. Knowing 20 people personally is “anecdotes,” not evidence. Just make your assertions in terms of “I,” “me,” or “in my experience.” No one can argue with those. Finally, I always open and close every talk by thanking everyone for the opportunity to speak to them. They listened to you. Even if they were required to come, they listened politely. So thank them for it. Since you decided in advance that you’re a success if you reach just one person, the most important evaluation is the people who come up to you afterward. You reached each of those people, even if they come up to question or disagree with something. They thought enough of what you said to respond personally. If you feel good inside when you’re done, you almost certainly were good. But if you feel bad or not sure, it usually means you are too critical of yourself. That’s why you brought a friend. I always feel bad about everything I didn’t say. But the audience only knows what I said. That’s what matters. “Was I good or bad” is like asking if you’re a winner or loser. You overcame everything, showed up and did it. That makes you a winner. Like everything else in your recovery journey, there are no defeats, only learning opportunities. The useful learning question is what worked and what didn’t? That starts your preparation for next time. If your friend or the audience points out a problem in your delivery, you’ll think about it next time. The big ones to avoid next time are being too loud or too soft, or talking too long. Other criticisms are much more a matter of opinion and less important. Many groups require everyone in the audience to fill out an evaluation form. Usually, there are a couple of questions answered on a 5-point scale, then a couple of questions that ask for a comment. It’s important to read these, and equally important not to over-read them. If you see someone sitting and pondering his evaluation form, read it carefully. But the vast majority gives the forms very little time or thought, and neither should you. In general, think more about the positive feedback, not just to make yourself feel good, but because you can really only work on improving one or two things at a time. Just make sure you’re working on the most important things. By the end of your second presentation, you should know whether speaking is worth the trouble for you. My experience is that, after two talks, people know how good and powerful they are, and speaking is part of their recovery program. Groups of people see them as they really are, and the groups see a courageous fighter who is giving back and trying to help people. They don’t see a victim. That’s just as true for people who were afraid to try it the first time. After that, it only gets easier and more rewarding. Ken Braiterman, MA, has been speaking in public since he first preached to his congregation in 1959, when he was 11 years old. He has been telling his recovery story for eight years, and now teaches consumer/survivors to speak.